ok ladies now that we're in formation. — jsc. ok ladies now that we're in formation. 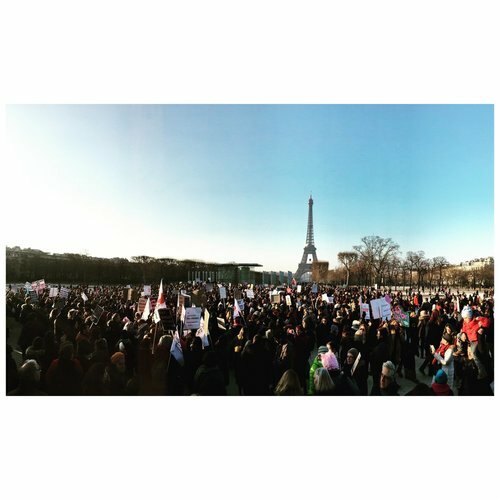 Although many of the signs I saw yesterday were anti-Trump or showing solidarity with the United States, the march also felt very personal for the French. As they are in a difficult election year, with Marine Le Pen in the running again (look her up if you're not familiar), this also felt as a statement of rebellion against their own government, a statement that said "hatred will not win here too", a statement that said "we see you Brexit, Trump, we see you and we will not do the same". I hope this statement comes true.